Male. Taken at Standlake Common, Oxon., on August 27th 2017. Female. Taken at Fence Wood, Berks, on July 1st 2018. 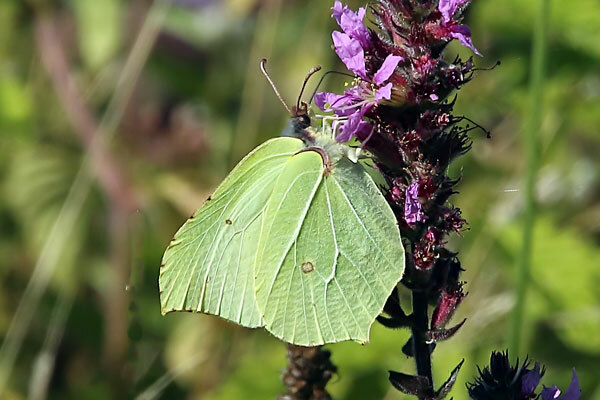 One of the first butterflies to be seen in the spring, the Brimstone is also one of the longest-lived in its adult form, with some individuals living for 10 or 11 months. Males are butter-yellow, and the females are a pale greenish-yellow. They always rest with their wings closed. It is mainly found in England. In Ireland it is only common in the Burren. It can be found anywhere that the larval foodplant grows, which is usually damp woodland. The main flight periods are March to June, then a second generation flies from late July to October or November, before entering hibernation. The primary larval foodplants are Purging Buckthorn (Rhamnus catharticus) and Alder Buckthorn (Frangula alnus). Favourite nectar sources are Thistles, Knapweeds, Scabious and Teasels. 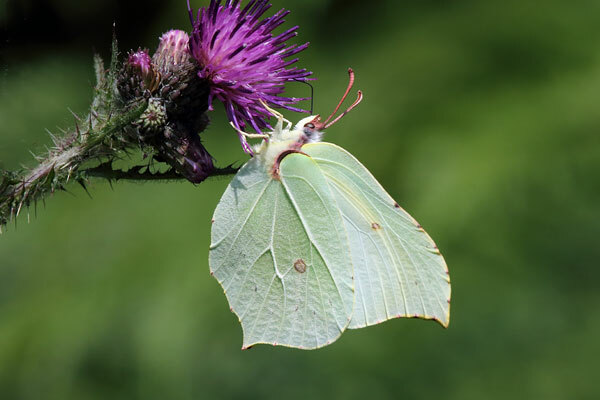 Male Brimstones can be found well away from breeding sites, often being seen on road verges and hedgerows, and in gardens. This species is of Least Concern on the UK list.